The FIM Junior Motocross World Championship event is recognised as one of the most important on the international motocross calendar, with the 125cc and 85cc categories featuring official world championship status and the 65cc category ranking as a world cup. It brings together riders from 21 different countries who not only race for their flag but also for themselves. After recently being crowned European Champion, Camden was ready to take on another big race of his career down under. Been hosted in Australia meant the team didn’t have any equipment of their own there so called on the support of local mx fanatic Glenn MacDonald who offered the team top class support. Day 1 of the event got off to a good start. There were 2 free practice sessions where Camden was able to get a good feel for the track and was in the top 3 for both these sessions. The afternoon qualifying session Camden was in a good flow and got faster and faster securing 2nd gate pick for the Sunday races. Day 2 was very different to day 1 with the track conditions being a lot wetter and the weather a lot cooler. Coming in confident after a good day 1 with some great riding Camden got off to a poor start in moto 1 when the rider to his right made a mistake of the start gate. Camden pushed through the pack from 5th last in the first corner to take a hard fought 7th place. Moto 2 he got off to a solid start coming out of the 1st corner round 8th and from there made some quick passes to get up to 3rd where he was able to challenge for 2nd but unable to make the pass so finished that moto in 3rd. He was really disappointed with bits of his riding and starts but he walks way from here with many valuable lessons learnt. 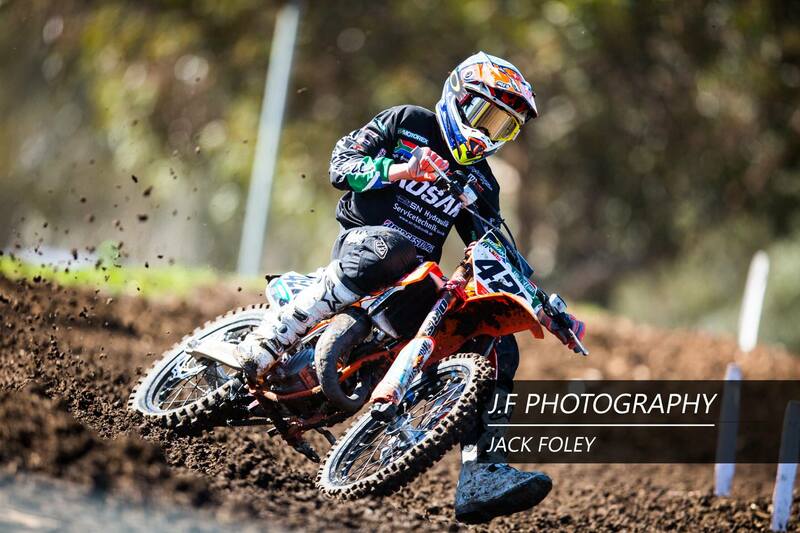 Camden finished the Junior World MX Champs 2018 with a 5th overall.